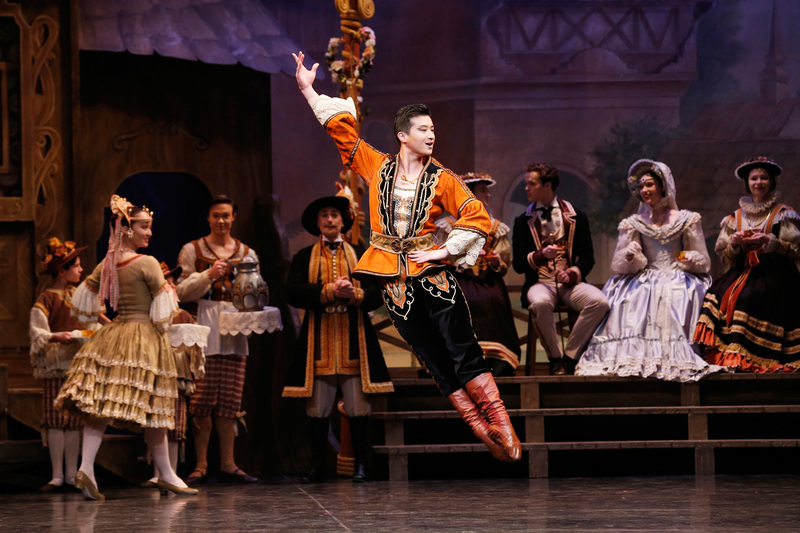 In sharpest possible contrast to the abstract modernity and compelling emotional force of Nijinsky, the gentle, family-friendly delights of Coppélia derive from the light hearted delivery of joyful classical dance. In this most traditional production of a most traditional ballet, the simple scenario is there to provide plenty of opportunities for celebration through dance. The treasured production was crafted by masterful artists, including The Australian Ballet’s founding artistic director Peggy van Praagh and acclaimed designer Kristian Fredrikson. Reproducing and adding to the established choreography, van Praagh filled the Palais stage with movement, particularly during the ebullient festivities of acts one and three. Director George Ogilvie included broad, clear storytelling that could be appreciated from the far reaches of the mighty Palais auditorium. Contributing both costume and scenic design enabled Fredrikson to match thematic colours to create an overall stage picture of great visual appeal. Attractive autumnal tones make up the predominant colour palette of the village square, where the Harvest Festival is being celebrated. Decorative details on the merry townsfolk’s costumes gives the impression of a quaint European village. Framed by the decoratively oversized gilt proscenium arch of the Palais, the production looks handsome and well proportioned. Usually heard but not seen, the musicians of Orchestra Victoria are on show in the wide, open pit of the Palais, a design that allows the music to fill the cavernous space without impediment. Maestro Nicolette Fraillon brings out the infectious pomp of Delibes’ delightfully melodious score, with gentle brass and percussive colour being highlights of the performance. The romance of the story was given a boost on opening night with the lead roles danced by newly engaged couple Ako Kondo and Chengwu Guo. Each of these Principal Artists was welcomed with entrance applause, and they went on to earn further acclaim as the ballet proceeded, not only dancing beautifully but also bringing out the comic elements of their characters. Act one’s Harvest Festival see the young people of the village alternate between female, male and massed corps dances. The festive tone is shaded with just an undercurrent of intrigue, which is focused on the house of Dr Coppelius and his exquisite “daughter” on the upstairs balcony. As the act concludes, Swanilda and friends dare to creep inside the house, while Franz prepares to reach the balcony by ladder. The work of lighting designer Francis Croese comes to the fore in act two, when multiple gleaming eyes shine through the spooky darkness of Dr Coppelius’ laboratory. When Swanilda and friends brings the life-sized toys to life, the effect is really magical. Carrying the majority of the ballet’s slender narrative, this act is expertly paced for maximum impact. 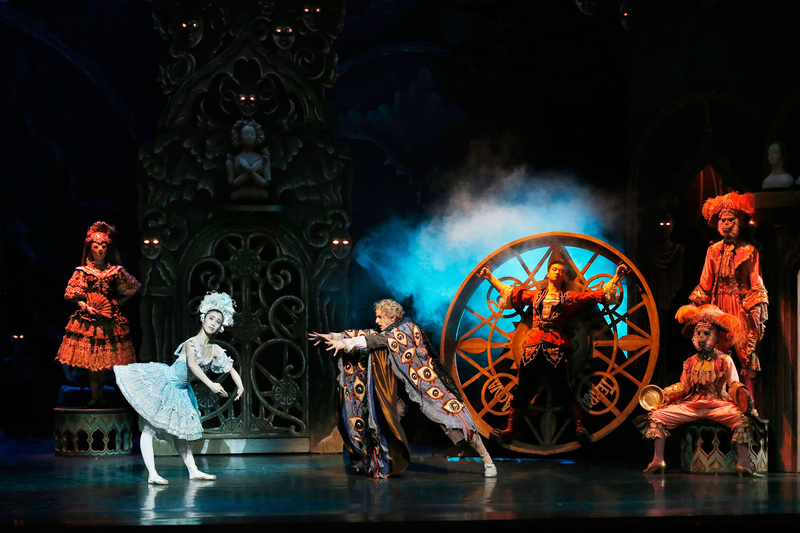 The ballet’s most famous sequence comes in act two when Swanilda takes the place of precious doll Coppélia. In a superb performance, Kondo begins with crisp, stiff doll-like actions with a wonderful gentle bobbing effect after each initial tentative move. Continuing through a series of dances as Coppelius hand her props, Kondo performs with a lovely level of radiant energy, successfully maintaining the tension of the storyline as Swanilda alternates between dazzling the deluded Doctor and taking every opportunity to frantically try to free Franz. Essentially a character role, Dr Coppelius is a thankless role for Principal Artist Andrew Killian, who acts the full range of the role but is giving precious little dancing to do. Act three brings a splash of additional colour as the female corps dance in turquoise with moon and star trim, a motif that links the design to the mysticism of original work. A highlight of act three is the exquisitely slow dance by Swanilda and Franz’s friends. Dressed in white, this group is luxuriously cast with a generous number of Senior Artists and Soloists. Another lovely highlight comes with Principal Artist Robyn Hendricks’ angelically ethereal work in the Prayer solo. Celebrating their wedding, Swanilda and Franz perform a grand pas de deux that is beautifully slow and measured. Playing a plucky lad is an ideal fit for Guo’s boyish charm. His solo work following the grand pas de deux is characteristically spectacular, giving the fleet footed star the chance to dazzle with the speed of his pirouettes and the seemingly effortless height and feather-light landings of his leaps. 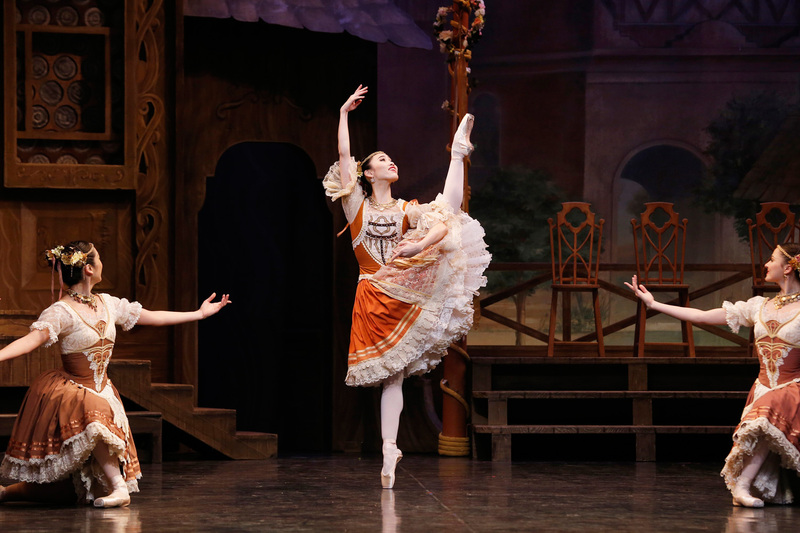 Coppélia is ideal family entertainment, perfectly timed for the current Melbourne school holidays. Coppélia plays at Palais Theatre, Melbourne until 1 October 2016 and plays Joan Sutherland Theatre, Sydney Opera House 2 – 21 December 2016.